Gravelly pastures, sandy abandoned fields, prairies, barrens. Occasional along roadsides and railroads. Ontario and OH west to ND and WY, south to TX and NM. Has been introduced further east from MA to DE and WV. 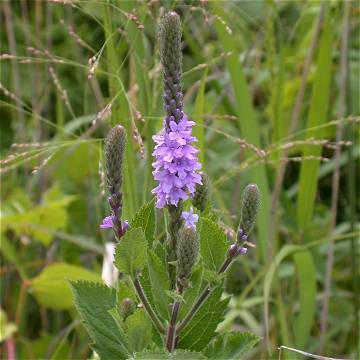 Herbaceous perennial to 1.2 m. Stems subterete, somewhat densely pale-hairy. Leaves ovate to elliptic or suborbicular, to 5 cm wide and 10 cm long, sessile or nearly so, thick, sharply serrate, hirsute and rugose above, densely hirsute-villous and veiny below. Flowers in one to several long, thick, compact spikes; bracts lance-subulate, about equaling the calyx, hirsute, ciliate; calyx 4-5 mm, densely hirsute with acuminate lobes; corolla blue-purple or lilac, the tube somewhat exserted, hairy, 7-9 mm wide. Fruit an ellipsoid nutlet, 2-3 mm, raised-reticulate above and striate below. Hybridizes with other species in the genus.